The Cover: So much better than the first one! I liked the first one, but this cover looks like an actual human being! I love the colors and I love that the book is mostly white. There are so many dark and black covered books out there, this one will stand out on the shelves. The Characters: I am still a big fan of Clare. She seems like a real person- she isn't perfect, she makes mistakes, and acts like a normal teen. I still didn't get to know much more about Gabriel or Justin in this book- which was disappointing. 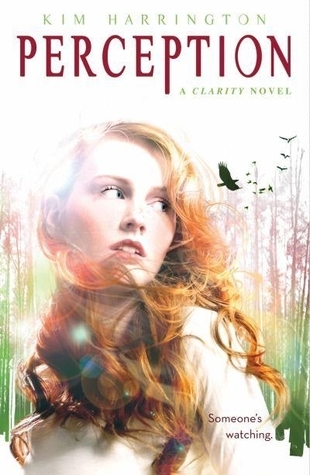 Clare does make her choice of who she wants to be with in this book. A new friend is introduced for Clare named Mallory. Without getting into spoilers, I wasn't a fan of Mallory's character and I didn't consider her a good friend for Clare. I am still a fan of Clare's family, and I wish more of the story line could have revolved around them. The Story: This was a fun mystery, just as the first one was. The book was never predictable and kept me on my toes the entire time! The author drops so many hints throughout book one and book two- some matter, and some are to trip the reader up. This was a short novel- only a little over 250 pages and I read it in one sitting. Although it was a mystery, it wasn't gruesome or gross, and I appreciate that. I do hope, though, that this series continues- there are so many plot lines that are left open. I really do want to know what happens! I agree, this cover is much more appealing and less creepy. It's always good that the MC is likable, but not so good if it's the sequel and there's still very little dimension to the guys. I'm glad she chooses someone, though. :D Most authors milk love triangles for the whole trilogy and make it a big dramatic conclusion in the last book, so kudos to Kim Harrington for not doing that.